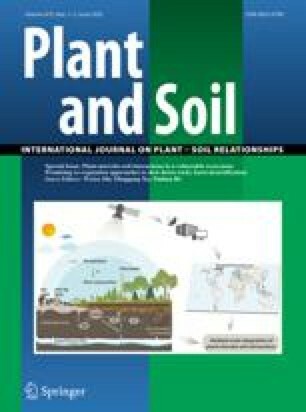 Phytostabilization strategies may be suitable to reduce the dispersion of uranium (U) and the overall environmental risks of U-contaminated soils. The role of Glomus intraradices, an arbuscular mycorrhizal (AM) fungus, in such phytostabilization of U was investigated with a compartmented plant cultivation system facilitating the specific measurement of U uptake by roots, AM roots and extraradical hyphae of AM fungi and the measurement of U partitioning between root and shoot. A soil-filled plastic pot constituted the main root compartment (CA) which contained a plastic vial filled with U-contaminated soil amended with 0, 50 or 200 mg KH2PO4−P kg–1soil (CB). The vial was sealed by coarse or fine nylon mesh, permitting the penetration of both roots and hyphae or of just hyphae. Medicago truncatula plants grown in CA were inoculated with G. intraradices or remained uninoculated. Dry weight of shoots and roots in CA was significantly increased by G. intraradices, but was unaffected by mesh size or by P application in CB. The P amendments decreased root colonization in CB, and increased P content and dry weight of those roots. Glomus intraradices increased root U concentration and content in CA, but decreased shoot U concentrations. Root U concentrations and contents were significantly higher when only hyphae could access U inside CB than when roots could also directly access this U pool. The proportion of plant U content partitioned to shoots was decreased by root exclusion from CB and by mycorrhizas (M) in the order: no M, roots in CB > no M, no roots in CB > M, roots in CB > M, no roots in CB. Such mycorrhiza-induced retention of U in plant roots may contribute to the phytostabilization of U contaminated environments.